Boat and pontoon owners now have a value based storage alternative with fabric covered boat sheds. Fabric covered boat sheds and shelters are polyethylene covered buildings which are supported by a structural metal framework. Boat shelters are very advantageous due to their portability, affordability and ease of construction by consumers who do not have construction experience. The most advantageous benefit of boat sheds is that they cost a fraction of what a conventional wood, brick, metal, or vinyl sided storage shelter can cost. While the cost may be low, boat sheds can provide protection for up to 20 years before cover replacement. Even though boat shelters are actually classified as “temporary” structures in most instances, they can be used for thousands of applications. These products are available in many different sizes. When considering a boat structure, it is important to consider the size of the door opening on the shelter. The smaller shelters such as 8’-14’ wide can be used to store garden tools, small boats, motorcycles, snowmobiles, lumber, ATV’s, lawn mowers, and more!! The 12’-14’ wide shelters are most commonly used to store cars, trucks, boats, trailers, pontoons, campers, small equipment, and more!! The intermediate sized boat shelters are typically placed on gravel or concrete due to them being used to store vehicles and equipment. Large boat sheds are often used to store pontoons, RVs, trucks, and other equipment. 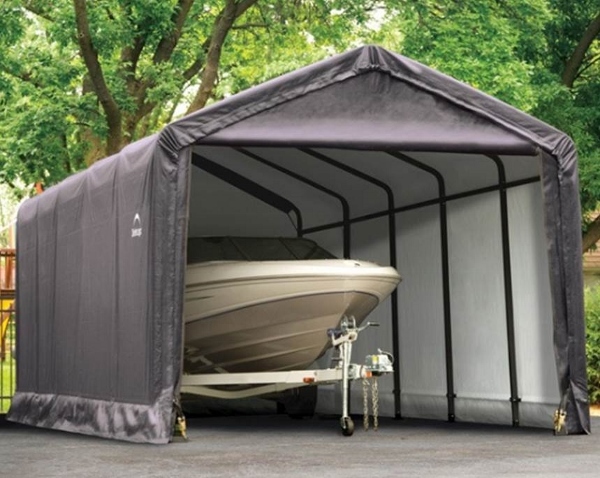 When fabric covered boat shelters become larger, they are often mounted on wood posts, blocks, or a concrete foundation. We invite all prospective consumers to view our large selection of boat tents, shelters, and garage products by selecting the appropriate size to the left.